Helena Bonham Carter as Rose Weil in Ocean’s 8. There’s a big one on Sandra Bullock’s Met Gala gown. Roughly two minutes into watching Ocean’s 8, you get the idea that this movie isn’t just going to be about con artists who happen to be women — this movie is going to be about fashion. In one of its first scenes, the titular Debbie Ocean, played by Sandra Bullock, is fresh out of prison and back in the glittering evening gown in which she was arrested five years prior. Her first stop? Bergdorf Goodman, where she engages in the film’s first taste of the scammery to come: Ocean picks up a few beauty products, brings them to a different counter, and asks to return them all. No, she doesn’t have the receipt, she says, as if anyone would dare demand one of her, and after a heated back-and-forth with the salesperson, she sighs and says she’ll just keep them after all. “Can I at least have a bag?” she asks, before walking out, totally inconspicuously carrying a few hundred bucks’ worth of department store skin care. It was the first of a few times during the film that the audience actually clapped — whether that’s because six of its eight main characters were in the theater (guess who wasn’t present!) is unclear — but was just one of the many delightful instances where characters engage in high-stakes fashion grifting. How timely! 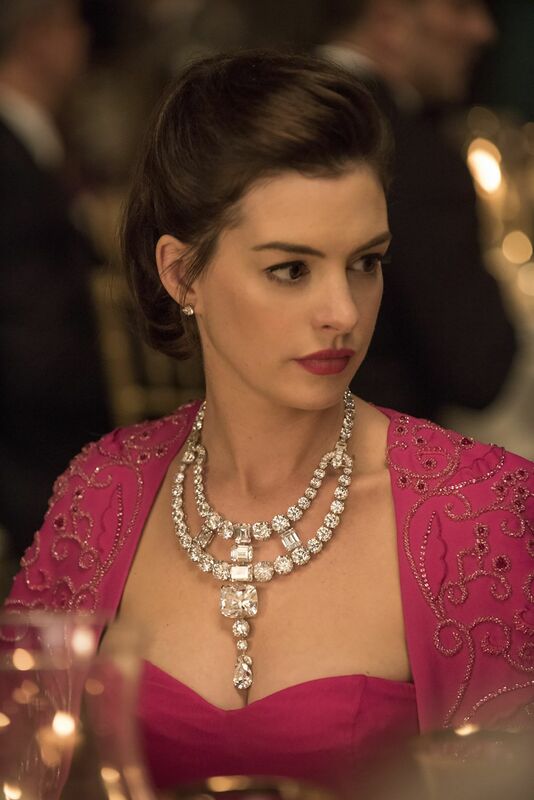 Anne Hathaway as Daphne Kluger, wearing the $150 million Cartier “Toussaint” necklace. Grifting is, obviously, the plot of the entire film: Finally on parole after being imprisoned for a crime that isn’t immediately explained, Debbie Ocean recruits Lou (Cate Blanchett), whom we’re introduced to as she’s pouring water into vodka bottles at the seedy nightclubs she owns, for a heist. Their target is the $150 million Cartier “Toussaint” necklace, but they’ll have to find a way to not only get it out of its locked underground vault, but use the washed-up fashion designer Rose Weil (Helena Bonham Carter) to convince an A-list actress (Daphne Kluger, played hysterically by Anne Hathaway) to wear it at the upcoming Met Gala. Once it’s around her neck, it’ll take the Caribbean hacker Nine Ball (Rihanna), the jewelry maker Amita (Mindy Kaling), the pickpocket Constance (Awkwafina), and the suburban mom turned undercover Vogue assistant Tammy (Sarah Paulson) to actually get it off. “Going back to the original [Ocean’s 11 film] in the 1960s, fashion was a character in the movie,” said costume designer Sarah Edwards in a March interview with the Hollywood Reporter. Because it’s set during a high-speed heist, she explained, each character had to have her own instantly recognizable personal style. There’s Bullock, who’s often in sleek workwear, while Blanchett looks as though she could be onstage backing up Harry Styles, wearing velvet suits by Burberry and Saint Laurent ties. Edwards used Elizabeth Taylor as inspiration for Hathaway’s character; Vivienne Westwood and Grace Coddington for Bonham Carter; Tory Burch and Jenna Lyons for Paulson; and Bob Marley — as well as Rihanna herself — for Rihanna. The European royalty-themed Costume Institute exhibit that takes place in the film. The ’60s also make a cameo during an early scene in which Bonham Carter’s character Rose stages her disastrous fashion show. Filmed inside the historic TWA building at JFK airport and featuring 50 original designs, the theme is the way too on-the-nose “retro stewardess”; as the models walk down the airport hangar turned runway, the camera lingers on the whispers and cringe faces of its guests. It’s the perfect illustration of Weil’s fading relevance in the fashion world and, we soon find out, her financial destitution, making her the perfect recruit for a risky heist with a multimillion-dollar payoff. It’s Weil who introduces the audience to the mechanics of dressing a celebrity for the Met Gala: Though she’s too far past her heyday to even have a chance of dressing a star as big as Daphne Kluger, the brains behind the operation, Debbie and Lou, coach her on how to do so. The trick? Fool a younger starlet (“Penelope Stern,” played by Dakota Fanning) into posing for a photo that looks like the two are having lunch to discuss a Met Gala gown, which then sends Kluger straight into her hands. Though in the real world, the New York Post doesn’t use photographs of celebrities dining with fashion designers as a hint of what they’ll wear to the Met Gala on its front page, it sure makes for a fun plot line in the film. Cate Blanchett’s Givenchy Met Gala jumpsuit. Once Weil is confirmed to dress the A-lister, the crew can approach Cartier in an attempt to convince it to let her borrow the $150 million necklace. Called “the Toussaint,” it’s named after Jeanne Toussaint, the real-life female Cartier creative director in the 1930s, and is based on a 1931 design that Jacques Cartier made for the maharaja of Nawanagar, according to WWD. The brand’s status as “exclusive jewelry partner” of the film even had a real-life aftereffect earlier this month when Rihanna wore Cartier to the actual Met Gala. The gala that takes place in the film, however, is also sort of hilariously similar to this year’s real theme. In the fictional exhibit, centered on European royalty, we see rows of embroidered silk capes and gowns, often topped with elaborate bejeweled headpieces that echo the garments of “Heavenly Bodies: Fashion and the Catholic Imagination.” And Dolce & Gabbana, a brand with a strong presence at this spring’s exhibit, created 100 silk pieces specifically for the film to line the stairs of the Met. 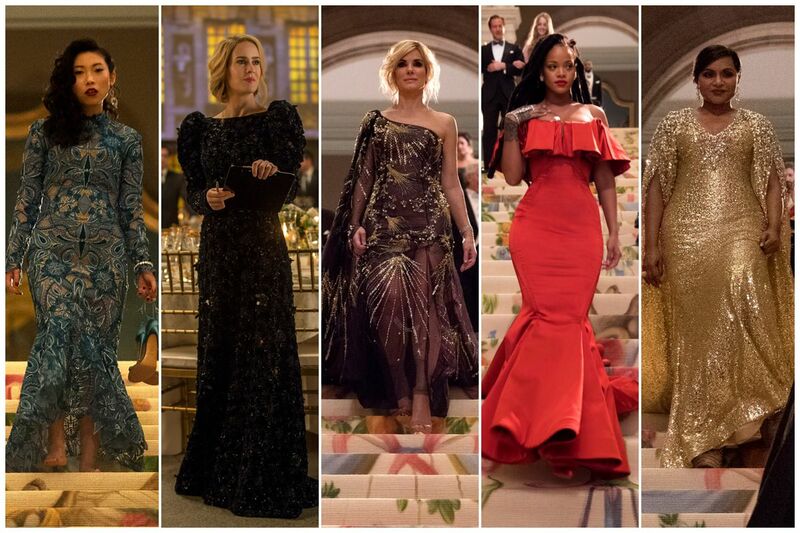 The gowns the characters wear to the gala have a similar story — Edwards had Vogue assist with asking different designers to create custom looks. To complement the extravagant Cartier necklace, Hathaway wears a magenta Valentino gown with an enormous cape that wouldn’t have been out of place on this year’s Met Gala red carpet. Blanchett, meanwhile, is in an emerald sequin Givenchy jumpsuit, while Rihanna wears a silky red gown by Zac Posen (another moment when the audience applauded). Bonham Carter wears floral Dolce & Gabbana, Kaling dons Naeem Khan, Paulson a velvet Prada, and Awkwafina a Jonathan Simkhai. From left: Awkwafina, Sarah Paulson, Sandra Bullock, Rihanna, and Mindy Kaling. Toward the end of the film, we discover that Debbie Ocean has been hiding in more ways than one — specifically by withholding some crucial information about the heist from her fellow con artists — and the stakes skyrocket. But by the final few scenes, when we get the glorious tracking shot of the eight women on the subway, we find out how said heist ends up affecting these women, and spoiler (literally): They’re still extremely fashion. Ocean’s 8 premieres June 8.